Designed by Porche and manufactured by LaCie, the $150 LaCie P'9223 Slim 120GB SSD delivers a capable and compact USB 3.0 storage solution. 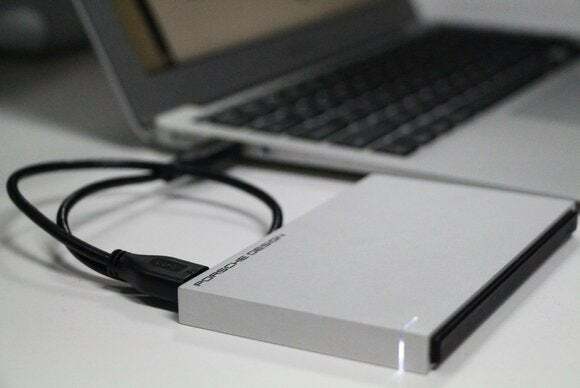 The external drive is thin, sleek and matches your Mac with its aluminum casing. Performance wasn't sacrificed for looks however, as the drive showed read times of 452.5 MBps running our in-house 10GB file copy test and 356.6 MBps running our 10GB folder copy test. Compared to OWC's Envoy Pro, another USB 3.0 external drive with flash storage, the P'9223 scored 11 percent faster on folder read test, and 6 percent faster in the file read test. Results are in megabytes per second. Longer bars/higher results are better. The write tests went the other way, with the Envoy scoring slightly better than the P'9223. Our test showed a write speed of 192.5 MBps when dealing with a 10GB file, and 184 MBps when dealing with a 10GB folder. Comparing that to the Envoy we can see that the P'9223 was about 10 percent slower than the Envoy in both write tests. The AJA test, which works directly off of the external drive, showed that the Envoy is superior if you plan to be doing any sort of intensive work on your data without copying it to your computer first. Bear in mind that the AJA test is designed to test performance when working with specific types of video files. Nevertheless it can give you an insight into how the drive performs when working off of it directly. The faster speeds seen with the Envoy drive be the result of the Envoy simply having a larger drive to work with, but it could also have a larger cache onboard. When it comes down to it, the P'9223 isn't a bad deal. The drive isn't outrageously priced for the performance you get, and it comes in an attractive package. LaCie also offers a 500GB hard drive in place of the 120GB SSD for just $85, but you won't get the same speed and general reliability of a SSD drive.